Innovative Technologies for Food Preservation: Inactivation of Spoilage and Pathogenic Microorganisms covers the latest advances in non-thermal processing, including mechanical processes (such as high pressure processing, high pressure homogenization, high hydrodynamic pressure processing, pressurized fluids); electromagnetic technologies (like pulsed electric fields, high voltage electrical discharges, Ohmic heating, chemical electrolysis, microwaves, radiofrequency, cold plasma, UV-light); acoustic technologies (ultrasound, shockwaves); innovative chemical processing technologies (ozone, chlorine dioxide, electrolysis, oxidized water) and others like membrane filtration and dense phase CO2. 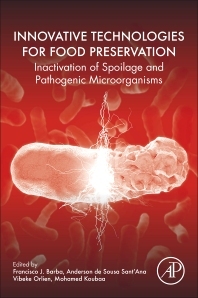 The title also focuses on understanding the effects of such processing technologies on inactivation of the most relevant pathogenic and spoilage microorganisms to ensure food safety and stability. Over the course of the 20th century, the interest and demand for the development and application of new food preservation methods has increased significantly. The research in the last 50 years has produced various innovative food processing technologies and the use of new technologies for inactivation of spoilage and/or pathogenic microorganisms will depend on several factors. At this stage of development there is a need to better understand the mechanisms that govern microbial inactivation as induced by new and innovative processing technologies, as well as suitable and effective conditions for inactivating the microorganism. Assistant Professor in Nutrition, Food Science and Technology, Faculty of Pharmacy, University of Valencia, Spain. He holds a Ph.D. in Food Science and Technology at University of Valencia and he hold degrees in Pharmacy, Food and Technology. He has performed a postdoctoral stay in the Université de Technologie de Compiègne (UTC), Département de Génie des Procédés Industriels, Laboratoire Transformations Intégrées de la Matière Renouvelable (Compiegne, France) and nowadays he is doing a postdoctoral stay (Marie Curie IEF) in the Department of Food Chemistry (University of Copenhagen) to explore different non-thermal applications for preserving and extracting bioactive compounds from plant food materials and by products. Prior to his current appointment, he was also engaged as a visiting researcher in the Department of Food Biotechnology and Food Process Engineering in Technological University of Berlin, Germany. His research focus is on non-thermal processing for preservation and/or extraction of bioactive compounds from liquid and solid food. He has more than 100 publications, including 60 published or accepted peer reviewed papers in international journals of high impact factor in the Food Science and Technology area (Journal Citation Reports, ISI Web of Knowledge). Assistant Professor in Food Microbiology at the Department of Food Science, Faculty of Food Engineering, University of Campinas, Brazil. He has a Bachelor degree in Industrial Chemistry (USS, Brazil), Master of Science in Food Science (UNICAMP, Brazil) and PhD in Food Science (USP, Brazil), including a one-year internship at Rutgers - The State University of New Jersey (New Brunswick, USA). He was a postdoctoral fellow at the University of Sao Paulo and currently he is involved in teaching (graduate and undergraduate) students at UNICAMP and his major interests are focused on quantitative aspects of food microbiology and safety, including predictive food microbiology, microbial risk assessment and meta-analysis. Dr Sant'Ana has published over 55 peer-reviewed articles and currently serves as Editor-in-Chief of the scientific journals Food Research International and Current Opinion in Food Science. Associate Professor and Head of Food Chemistry section, Department of Food Science, Faculty of Science, University of Copenhagen. Her research areas are thermodynamics in food chemistry with emphasis on HP methods in food processing and the effects on food components and their properties, including oxidative stability and protein modification. She has been leader of several national and international projects. She has been supervisor of several BSc theses, MSc theses, PhD students and postdoc people. She has 39 publications in international journals with peer review, 10 articles in trade journals, 7 appearances in Danish media (Newspaper or TV channels), and 3 recent oral presentations at international conferences. Assistant Professor in Ecole Supérieure de Chimie Organique et Minérale (Compiègne, France). He has performed different postdoctoral research stays as Research Assistant in the Department of Industrial Process Engineering, University of Technology of Compiègne (Compiègne, France), Department of Biological Engineering, National Engineering School of Sfax (Tunisia), and as Post-doctoral Research Assistant, in the prestigious Department of Molecular Genetics, Ohio State University, Columbus, Ohio (USA). His research focus is on non-conventional processing for preservation and/or extraction of bioactive compounds from liquid and solid food. He has more than 20 publications (book chapters and articles in international journals with peer review).